I allow my boys to toss inside our shopping cart instant food when we do our monthly grocery. I, too, have my list of instant beverages, sauces, and food to make my life easier. And speaking of benefits, allow me to share with you what I consider as the advantages of ready to eat products. Convenience food helps us save time. Because it is already cooked, the preparation time is likewise cut to several minutes. Best, it is readily available for consumption. Many ready-to-eat products are readily available in convenience stores and even supermarkets. Scarcity issue, I believe, is never a problem. Not all instant meals are bad for the health. There are some that have preserved nutritional value, thanks to today’s technology and innovation. Also referred to as convenient food, such kind of product is the practical way to give immediate satisfaction to one’s craving or hunger. Sometimes, it is the sensible choice, too, for those facing difficulty cooking or preparing breakfast, lunch or dinner. One favorite grocery item my boys so love recently is the new Maya Happy Mug. 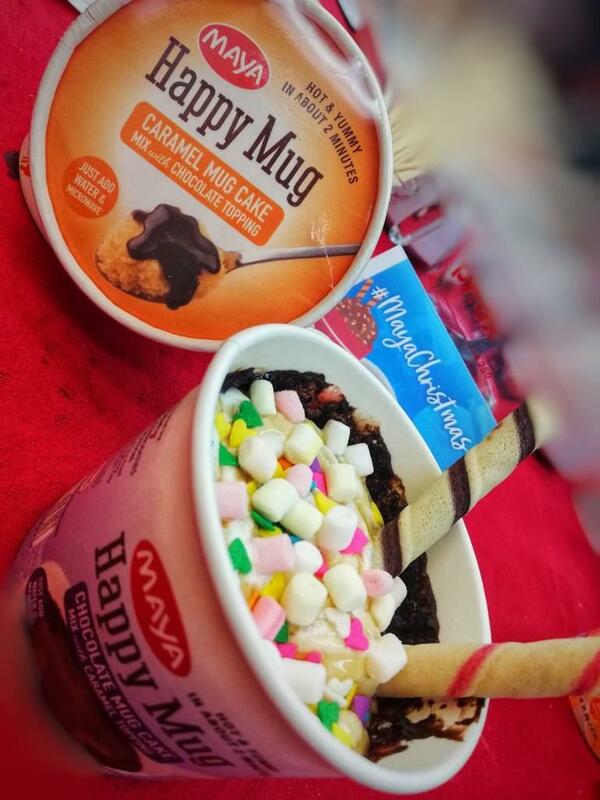 This brand new Maya product is an instant treat for someone craving for delicious cakes. 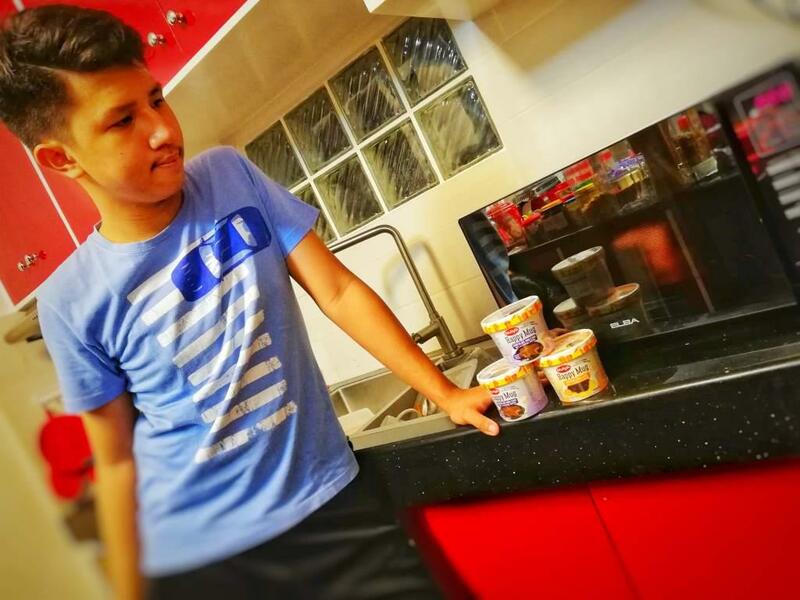 It comes in a single serving that is ready to mix- just microwave for two minutes and a warm, tasty cake is readily available in your hands. To all the more satisfy one’s appetite, one can top the cake with marshmallows, cereals, chocolate pieces, and even fruit slices and chopped nuts. Available in Chocolate and Caramel, this convenient little mug cake also comes with its own rich and delectable sauces. Well, I caught my two boys creating their mug cakes one evening. Though we already had our dinner, they told me they can’t sleep and so they will just have a quick chess match. And to make their game extra fun, they will microwave Maya Happy Mug. They even asked me if I want one and I happily nodded. They also made me arbiter for their game. I believe, more than the time saved and convenience to prepare, it is the immediate satisfaction these ready-to-eat products give that make them appreciated, well-received, and loved. As for this momi, it is during those instant craving satisfactions that she gets the chance to bond more with her boys. After all, the best nights are usually those unplanned, random, and spontaneous. I must confess to not being a huge user of convenience food in general, but you do make some very valid points 🙂 It can be handy! I remember when our oven packed up we lived off this stuff for a few weeks. The kids didn’t complain at all lol!! I 100% eat convenience food when in rush, nice to see you reminding people that sometimes it is okay. My one thing I always do is make sure that the ingredients are healthy and that I can pronounce them. I just love mug cakes. They are so easy to make! I’m all about foods that are quick and easy. I have never heard of mug cakes before. I am sure that my twins would love them. I will keep these in mind as a special treat. The occasional convenience food (like pizza on Friday nights – what we do probably every other week) is always fun. My boys would love these cakes. They are only allowed to use the microwave so that is a plus for these. It just makes things easier sometimes. It’s hard because I work full time, i’m a student, and I am trying to start blogging and YT. That mug cake looks yummy! I could go for something like that. There are somethings that just make life easier and convenience food is it! My favorite is pre cooked chicken and rice. Instant meal! I am for anything convenient. We, busy moms cannot afford to waste a minute in our busy daily lives. This is a good option to my kids’ snacks. Convenience foods get such a bad rap, when they shouldn’t. I think moms are way over worked as it is, if microwaving a mug cake for the kids at the end of the day makes them happy, then go for it! Life is too short to stress out over not making every little thing from scratch. In my opinion food is a very personal thing so everyone has the choice of eating fresh food or convenience food. All is good as long as the people is happy with their choices. Whatever helps you bod with those boys is a great way to enjoy family time together. Oh, yum. I am not sure how healthy it is but I am in. I love cake. Yes, I am totally agree with Convenience food always save my time and it’s easily available. I am not yet married nor have kids but I do understand your point. I have some colleagues who do the same in order to save time and have some quality time with their children and I must say its not bad at all. No idea what I would do without convenience food. It saves my time and life right now. This is awesome but not in regular basis. I tried not to abuse convenience food for healthy reason.